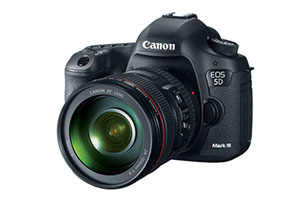 Canon has released a firmware update for the Canon EOS 5D Mark III. Supports the single focal length EF40mm f/2.8 STM lens that is to be released at the end of June, 2012. Fixes a phenomenon in which an image may become underexposed when using the Auto Lighting Optimizer for continuous Auto Exposure Bracketing (AEB) shooting. Fixes a phenomenon in which the backlight of the LCD monitor may not turn off depending on the camera settings and timing. Fixes a phenomenon in which the camera’s power may not turn on when a super-telephoto lens (1) is mounted to the camera with an extender (2). You can download the new firmware directly from the Canon USA website. The canon 5D mk iii is one of the best digital SLR cameras out in the market and I highly recommend it as I have been using the 5D series since it came out. Although I have been getting an error 80 since updating to latest firmware. Has anyone been encountering the same thing? If you Google for error 80 you'll find that many other people suffer from an occasional error 80. It doesn't seem to be firmware related, though everyone hopes it will be fixed by some update. From what I've seen so far, the remedy is to turn the camera off and remove the battery. Error 80 should then be gone next time you use your camera. With these latest cameras both Canon and Nikon seem to have some issues with QA. Nikon had the problem where the D800 would lock up and you also had to remove the battery to get round this (has been fixed by firmware now), and the 5D III has the error 80 problem. Hopefully Canon can fix this quickly.